Our version of the classic chocolate confection that has become a tradition to be consumed throughout Christmas time. 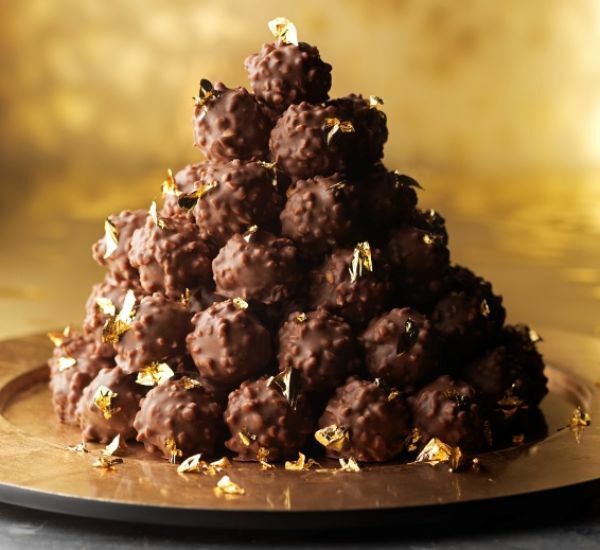 Evoking memories of towers of gold wrapped rochers and chocolate decadence! We hope you enjoy this recipe. These are also featured as one of our crowdfund rewards along with the book Nostalgic Delights, by Jacqui Small Publishing. Put the cream in a saucepan and scrape in the seeds from the split vanilla pod (bean). Bring to the boil, then remove from the heat and leave to infuse for 30 minutes. Strain the infused cream into a clean saucepan and bring to the boil. Put the chopped chocolate in a mixing bowl. Pour the boiled cream over the chocolate and mix until emulsified and a ganache consistency is formed. Add the softened butter and mix well until fully incorporated. Leave to set at room temperature for about 1 hour. Put the Praline Ganache in a piping bag fitted with a 12mm nozzle. Pipe small bulbs of the ganache onto a silicone-lined tray. Put a whole roasted hazelnut onto each bulb of ganache. Pipe a larger bulb of ganache on top of each hazelnut and leave to set in a cool, dry area. 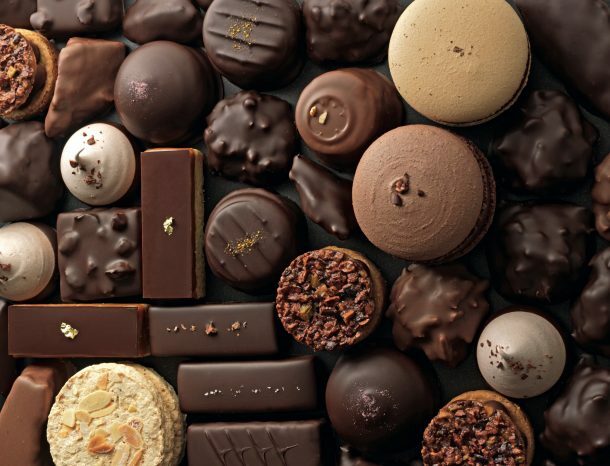 When set, roll each piped chocolate into a ball. Temper the milk chocolate and mix with roasted nibbed almonds. Coat each chocolate with the almond mixture and allow to set for at least 30 minutes.